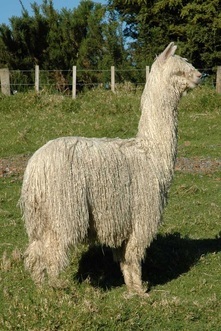 Tiaho is a magnificent solid white suri male alpaca. 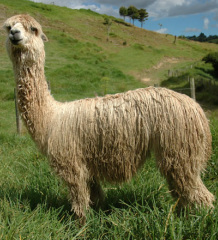 His fleece is exceptionally lustrous and fine and he comes from an impressive genetic background. His sire is Surilana Parsifal who has produced multiple champions and Supreme Champions. His dam is Kandiah Olivia who has won numerous broad ribbons both in the breed show ring as well as for her fleece, including best suri in show. Tiaho himself has 12 Broad ribbons including Supreme Champion on 2 occasions both as Junior and Intermediate as well as Champion Suri. Kahu has an exceptionally fine fleece with wonderful lustre. He has been Champion Fawn on multiple occasions. His dam was awarded CHAMPION Mid/Dark Fawn Female Suri at 6 years of age at the AANZ Colourbration show in 2012. With an excellent solid black sire he has a good chance of throwing black if put to a good solid black dam.